Thanks to everyone who came out on Tuesday - good times. And special guest Vicki Cooperman. 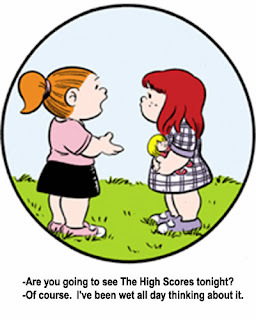 By popular demand, here's the details of The High Score's next gig. We're starting a run of shows every other Tuesday Night at "The City Theater" at Broadway Comedy Club on 53rd. We will be joined each week by special guests from the worlds of sketch comedy, improv, and stand-up, with some weird and generally amusing stuff mixed in. This week we will be joined by the hilarious Matty Goldberg, Jessica from Geek Dreams, and other surprise guests. $5 and a drink for some of the best sketch comedy in NYC. 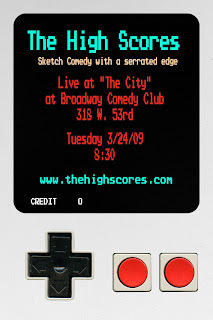 The High Scores are happy to announce we will be doing a run of shows at "The City @ The Broadway Comedy Club". We'll be there at 8:30 every other Tuesday, starting on March 24th. Join us for some great sketch comedy from us and performances from other sketch groups, improvisers, stand-ups, and interesting people. Details and a fancy flier to follow. All your Tuesdays are belong to us!